Each year I pick a word for the New Year that will inspire me to be my best. I started this practice six years ago and as you may know I wrote One Word with Dan Britton and Jimmy Page to help people discover their word for the year. My words over the years have been PURPOSE, SURRENDER. SERVE. PRAY. RISE and FORGIVE. Each word has molded and shaped me to become a better person, father, husband, writer and communicator. It's also a fun team exercise and much more effective than New Year's resolutions. 9 out of 10 people will fail with their resolutions. But one word sticks. No goals. No resolutions. 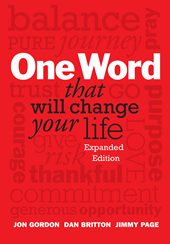 Just one word that helps you write a yearly chapter in your life story. While one word is very powerful and life changing Dan, Jimmy and I have really been thinking a lot about legacy this year. While engaged in a meaningful conversation one day we asked each other what word would you put on your tombstone. We found it was a totally different thought process than coming up with a yearly word. Dan chose Passion. Jimmy said Inspire. And I said Positive because I know it's my life's work and legacy. Then we wondered what words would capture the essence and legacy of some of history's heroes. Perhaps Abraham Lincoln's Life Word would have been unity. Martin Luther King Jr., equality. Mother Theresa, compassion. Susan B. Anthony, vote. 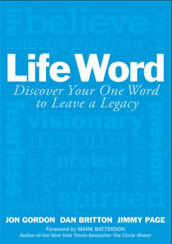 We realized that if we could help people identify their Life Word now it would inspire them to live their highest purpose and leave their greatest legacy. 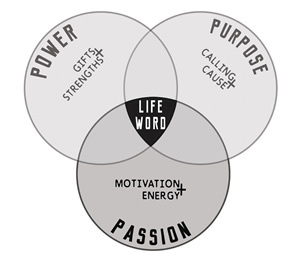 We decide to create a simple 3 step Life Word process. So this year I hope you join me in choosing a word for 2017 and a Life Word for your life. When you know your words I would love to hear them. One of my favorite things is to hear people's words and why they chose it. You can share your words with me and others on Twitter or Facebook.